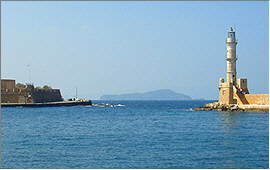 is the largest Greek island, and the fifth largest in the Mediterranean. Four big mountain massifs form the landscape, three of them having numerous summits of more than 2,000 meters height. 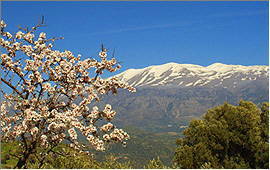 Crete had it's first flowering period during the Minoan Age which began about 2,800 BC. Therefore, this oldest civilization in the Eastern Mediterranean is only some 3,500 years younger than the Proto-Germanic civilization. It does however not descend from the older one but developed independently, probably from roots of North African origin. Thus, the Cretan culture did also not produce any comparable scientific and technologic peak performance such as e.g. the Henge Culture at Goseck (Sachsen-Anhalt, about 4,800 BC). It's emphasis is more in the fine arts sector, which later on continued in the boom of paintings and statuary in ancient Greece. About the original Cretan language however, almost nothing is known up to the present day. The Greek language which developed much later from about 2,000 BC on is a member of the indo-Germanic family of languages, mainly based on a lingual parent from the northern Balkans. Since about 1,100 BC then, Crete was almost permanently occupied by non-European forces and had it's second flowering period not before the Venetian Era from 1204 till 1645 A.D. The Turkish occupation endet in 1898, and Crete joined the Greek Republik in 1913.
in front of them to open the more detailed presentations. 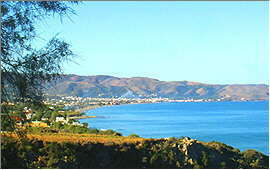 lies in the western part of the bay of the same name, in the Far West of Crete's north coast. On the scene there is everything what makes a genuine Cretan small town complete: Restaurants, tavernas, street cafes, doctors' offices, pharmacies, a small hospital, post and bank offices, a high school, supermarkets and shops of many kind. is a village in the eastern half of the bay of Hania, some 8 kms west of the city on a small peninsula, just opposite to Thodorou island. 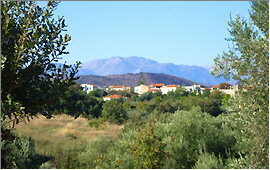 The bigger hotel sites of the region concentrate here and in the neighbouring village of Platanias, followed by wide ranging gastronomic, sports and leisure facilities. 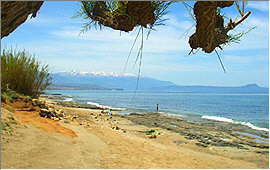 on the western north coast of Crete is the capital of the governmental district of the same name, and after Iraklion the island's second biggest city. West of the old harbour basin there is the Venetian old town which today includes many small hotels and tavernas. 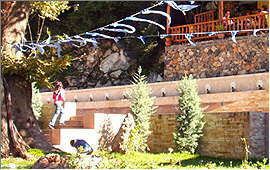 Balconies which were fixed subsequently, and the minaret by the church of Aghios Nicolaos remind to the Turkish occupation. 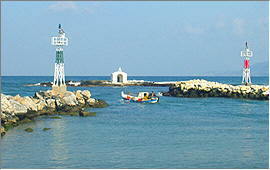 is a former fishing-village at the western end of the bay of Rethymnon. Established around the old village center are apartments and hotels that offer a variety of choice and size. 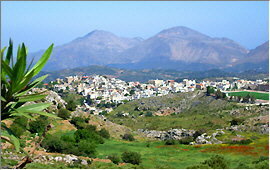 is one of the villages above the bay of Rethymnon, by the Old National Road to Georgioupolis and Hania. Due to the panoramic views, numerous private holiday villas have been built during recent years on the hills and slopes that frame the village. Many of them can be hired by the week as well. 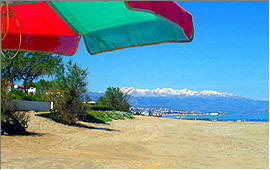 on Crete's north coast is the capital of the governmental district of the same name. It ranks as the island's cultural center and gives home to several museums, to the philosopical branch of the University of Crete, and other facilities. The town's landmark is the Fortezza, a fortress from the Venetian period (1211 - 1646), standing on an exposed rock that reaches into the bay. is a small town counting only approx. 700 inhabitants. The surroundings are composed of particularly exciting landscapes. Mt. Vorisis (878 meters) towers above Spili, and the town itself is said to be most picturesque. In the town center, lifestyle is expressively relaxed. A Venetian style fountain with 25 water-spitting lionheads is the town's landmark. 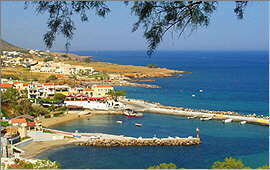 is an old fishing village on the south coast of the district of Rethymnon. It is known to individual tourists for some years, but still rather untouched by mass tourism. Around the port and further eastward along the sandy beach which lines the bay are some smaller hotels and apartment facilities. 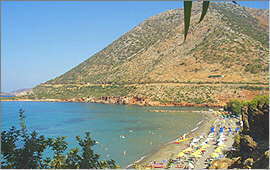 lies on the south slope of the small Vouvala Massif, which parts the bigger Kedros Massif from the south coast, and marks the south-eastern tip of the governmental district of Rethymnon. 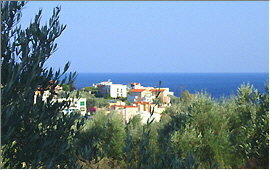 In recent years, many small hotels and apartments facilities have been built on the steep slopes above the small fishing port, enjoying unique views of the village, the coast and the Messara bay. 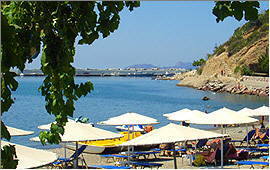 is one of the villages along the bay of Rethymnon where the touristic life of the region concentrates. The sandy beach spreads in both directions over a total distance of 15 kms. 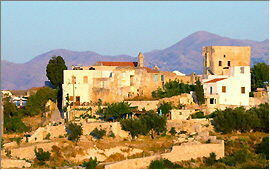 is a picturesque medieval village on a slope above the bay of Rethymnon. Two watchtowers from the times of the Venetian occupation make the village's skyline in front of the Ida mountains. 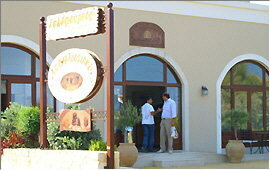 In the village center there is a kafenion, a herb shop, and the taverna of Papas Nikos who is the local priest. has only one bigger hotel resort and some medium-size ones, but in exchange there are several friendly private apartment facilities which mostly have their own swimming pools. By the main road there are tavernas, supermarkets, car rentals, bistros and ATM machines, and the shops and restaurants on the scene are prepared for the demands of individual tourism. is not really a genuine village. It is more a settlement on and between some hills, where some lanes and a number of houses have been built during recent years. Among others there are private detached single-family homes and apartment facilities, and since some years there are also some lovely holiday villas which can be hired by the week. There are 3 supermarkets, 2 butchers' shops, a bakery, 2 tavernas, a sidewalk cafe, a grillroom, a pharmacy, a ladies' hairdresser and barber's shop, a photo shop, an internet cafe, a gas station and some others else. 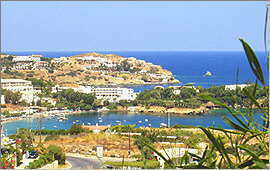 is the easternmost village inside the bay of Rethymnon. It includes two big and some smaller hotels, as well as a colourful mix of shops and catering enterprises which are mainly orientated to tourism needs. 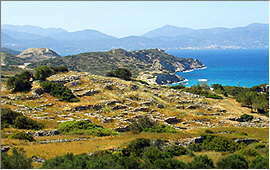 was the port of the ancient town of Eleftherna which is 22 kms to the south. It has a small excavation site, and a fortification from the Venetian era. In the village center as well as around the port there is today a number of apartment facilities, tavernas and shops which have adapted to the needs of a rather relaxed way of tourism. is a former fishing village on the island's central north coast. It is reported from old times that the village formerly had a different name. They say that during the era of the Turkish occupation, a Bey fell in love with the beauty of the fishing village and changed it's name into "Bali" as he was a lover of South Sea novels. is not only Crete's biggest mountain village, but with an altitude of 710 to 790 meters above sea level also one of the highest of the island. The people of Anoghia were allways highly respected for their musical tradition and all over Crete they have a reputation for their excellent dancers and folkloristic musicians. Some of the best families of musicians come from here. A treasure of the village is a tiny private ▶ museum that exhibits outstanding objects of the painter and sculptor Alkibiades Skoulas. 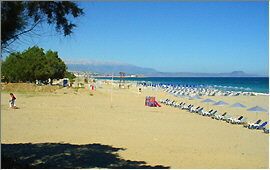 is a former fishing village on the central north coast of Crete, 18 kms west of Iraklion. 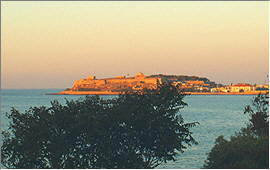 It lies on the slope of an peninsula in a sheltered bay which is divided into several smaller bays by spits of land. 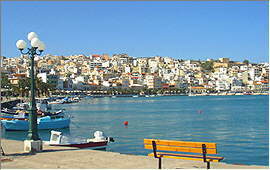 Restaurants, tavernas, bars and shops nowadays row up in the center by the old fishing-port. is the capital of the governmental district of Lassithi. 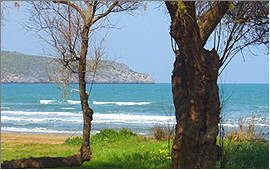 The inhabitants managed to preserve the original Mediterranean lifestyle, which mainly determines the character of the tavernas and kafenions around lake Voulismeni. Even being a visitor, one can sit and watch for hours how time goes by. is Europe's southernmost town. 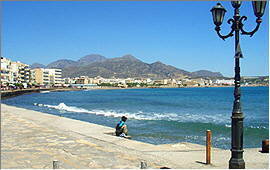 It lies in the Far East of Crete's south coast and is the fourth biggest town of the island. lies in the far east of Crete's north coast. 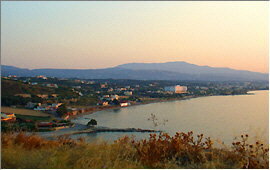 The island's easternmost town spreads from the port up the slope of Vamvakia peninsula. The promenade that flanks the port was re-designed some years ago, and today ranks as one of Crete's most beautiful ones.